seok ho kang has constantly worked on paintings featuring human bodies. The main subject matter of his early works is a human body wearing clothes. In his early works, the human body appears like a torso devoid of a head, arms, and legs. In these works, he effectively removes the hallmarks of a human body by illustrating the surface of a garment that covers it rather than directly depicting the body itself. In this way he unveils the beauty of form and color as well as texture. 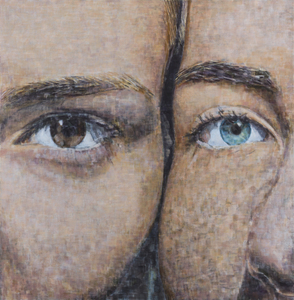 In addition, he has continued to work on portraying the human body in his series of paintings featuring a variety of images such as a man and woman, front and back profiles, a body wearing underwear, and a naked body. 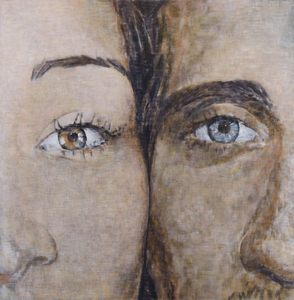 Some paintings feature the characteristic poses of celebrities without revealing their faces. These works showcase the uncanny aspects of his subject matter from his microscopic perspective toward the body, underscoring specific parts of the body without exposing the whole. 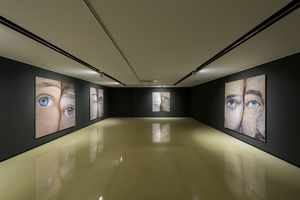 While all of his works focus on the human body as the most important subject, his statements and writings pertaining to his works and exhibitions clarify that any narrative on the body or the body as his subject matter is not very important. Such an element just works as a trigger for initiating his work. He instead seems to focus on seeking the beauty of form and exploring his own distinctive art and life. The comments commonly mentioned in writings concerning his works from his early years must be reviewed to confirm this. Such comments are mainly about paintings like self-portraits, the body portrayed like a landscape, laying more emphasis on the act of painting than the body as an object, and his pursuit of the beauty of form rather than any narrativity. If this is done, can any changes be discovered in the other from his previous pieces? The most noticeable feature above everything else is his portrayal of the face, a subject matter he had never addressed in his previous paintings. 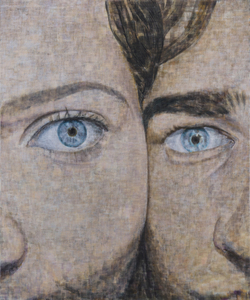 This serialized work features two people whose faces are in contact with one another and one of each of their eyes. Their emotions cannot be grasped through their facial expressions as no facial muscles have been illustrated. Similar to the style he used in his previous works, the faces have been cut by the edges of the painting. It is unclear whether he intended to focus on the faces or the eyes. 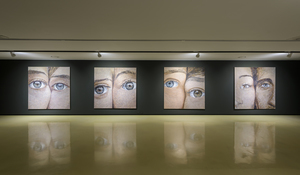 This series is obviously characterized by the faces of two individuals, not just one person, with a single eye from each one being emphasized. Let us now make a close look subject matter such as faces and eyes. 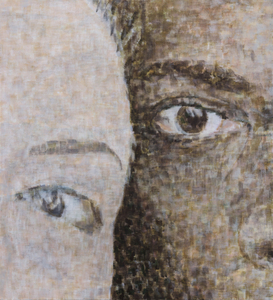 The keywords that can be adopted to analyze these works are “space”, “in-between” and “gap.” The gender and racial differences of the two faces are distinguished by their different complexions. 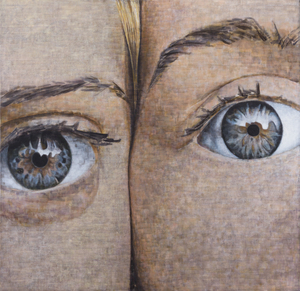 These paintings feature the right and left eye of each person which catch our attention. 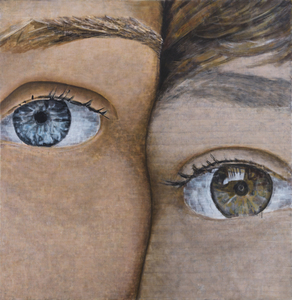 Their eyes do not seem to capture the same thing even though they are facing in the same direction. These faces, even if they are laden with affection and are in close contact, cannot be combined into one. This is perhaps in reference to the “space” or “gap” that the artist mentions in his works. The faces are divided with winding lines whose curves gradually become distorted. The space between the two is darkly expressed in a way that is similar to a black abyss or a deep valley. This division refers to the reality in which our diverse relationships exist. No matter how intimate we are, we cannot be perfectly one and the same. Even if the people have an affectionate, lovely demeanor, as in these works, it still comes off as rather bizarre. 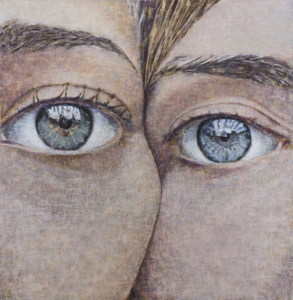 Their large eyes allow viewers to feel their own existence before his painting. Each eye looks at “me” as opposed to a faraway future. As viewers stand in front of his painting, they can feel themselves as they look at it as opposed to the looks or colors of others. In other words, I can sense “me” that exists in a non-material form. This may be the same feeling that seok ho kang frequently feels in front of his work. May any shift to this state be the issue he has inquired into through his works although such a feeling has more than likely become dulled as he executed his work over time? “I” turn out my work with my substantial “hands” while depending on my intangible character and nature. When this work gets to the state where no more paints can be applied, the moment of blurring or erasing even “my” nature arises at some point. He also has involved repetitive acts of amassing the moments in which reason and sensibility, individual and society, and the conscious and the unconscious cross paths in his work. He has adopted the other that can be interpreted ambiguously probably because he intends to include his own meaning alongside the other’s. One of the hallmarks of his work, repetitive actions can also be found in the fact that the title of his oeuvre has been Untitled. The selection of this same title stands for his intent to form relationships with all of his works as a series while he has painted a wide array of objects. Meanwhile, writings he wrote on his exhibitions give a glimpse of his work. These written in the form of an essay or novel are not attempting to account for his work but are thoughts about his daily life. This reveals that what he intends to represent is not any specific object of the body but the artist himself. 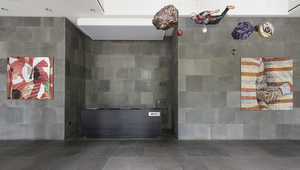 He has also engaged in curating several exhibitions. As such, he produced his own text in a wide array of ways. This production of his own text is neither to bring about any inner growth and change nor any constant evolvement. That is, the process of his work is inextricably bound up with his everyday life but it is not a process of exploring his true self through introspection on his work. Although he sees a specific moment when he is inspired by external influences or stimuli as the object of his work in the time and space he belongs to, the meaning of its subject matter and content disappear in the process of realizing them through his work, not addressing them seriously. This always returns to his own time and space. Thus he does not stop applying paints to his works until no more paints are required. Isn’t this his nature or a fateful action? What makes people do some predestined acts, what makes them subordinate to preexisting culture, stereotypes, and conventions, and something immaterial that lends meaning to social beings, has nothing to do with meanings intrinsic to each individual. This is like destiny. Any artistic emotion brings about some point where one realizes limitations and finitudes he cannot get over, momentarily appearing and disappearing. Such artistic element enables us to have insights into the world with the confrontation between matter and spirit, the static and the dynamic, restriction and freedom, and sense or passion and reason. kang does not pursue any specificity in order to make his life a work of art but constantly experiences common everyday things. He creates new things in the process of transporting such ordinary quotidian things to his works of art, but this after all has been fruitless. This is a way of balancing himself as an artist between inevitability and coincidence as well as a reason why he has consistently worked. As reviewed above, kang’s works can be fully understood by reading out the flows of his oeuvre and even his life rather than being grasped through distinction of his individual work or series. All the worlds and individuals including “me” do not progress in order to attain some specific purpose in a linear way but appear with their original traits. Thus what’s important in his work is that the ultimate objective of his life and art is to figure out his own nature through his own inner rhythms. He is able to transcend this only when he instantly sympathizes with repetitively occurring scenes and identifies himself with them. Art can be said to have been generated not from any perspective toward endless progress and the future but at some point where each individual’s habit, conventions, and consciousness are conjoined. This seems clarified through the process of his constant work but it has a circular rhythm that repeats ambiguity. The life and art kang has shaped as an individual is after all like the destiny each individual is influenced by. Whether we accept or reject it, this cannot be judged by what is right or wrong. What matters is how to view the meaning of my life that reveals itself at some moment according to a specific event and situation through a collision between adaptation and rejection. “I” here is both “me” and the other at the same time. Despite there being nothing definite in this process, the orientation of his work has been revealed vaguely and gradually as he accumulates experience of painting, writing and curating. His many activities are triggered by something like an impulse he feels over a series of time, as showcased in his work. What emerges in the process of constantly repeated life and work is a means to unmask differences, not similarities. These are defined by specific words and expressions in the process of analyzing his own work, but they soon gain the qualities of unrestrictedness and ambiguity not wedded to any specificity. What we discover in his work cannot be seen in terms of the narrative and meaning his works convey and cannot be grasped in terms of a study on the beauty of form he mentions. What we can conjecture is that, as reexamined above, the diverse text he has produced so far demonstrate the process of arriving at ambiguity from the moment when each individual’s linear time splits and an apparent, universal way of repetitively showing this. Thus we may be able to look back on his life and art as well as our own lives through his work, but it will soon be sent back again to an ambiguous narrative.